The second graph is interesting. The first one needs to be presented in log to prove the point, since the stock market is a growth process. Starting points make a huge difference (see climate graphs for example). Regarding the first chart, it doesn't make sense to start at 1982, since the period from 1982-2000 had an unusually high growth rate. The second chart is a bit misleading, as profits have for the past several years been anomalously high. They can, and likely will, decline, which would require stocks to fall further to maintain the P/E ratio. Whatever the scale, the first graph more or less makes the point that the bubble that is bursting now started in 1995, when the Clinton administration started to use the CRA to force banks into lending to people with poor credit ratings. This, combined with low interest rates maintained thanks to inflation being held in check by Chinese imports, allowed for the mess that is unwinding now. Next time you hear anyone saying how during Bill Clinton's presidency the economy was better managed than before or after, punch him for me, will you? One of the neat thing about doing the work is you get to pick the parameters. I happen to thing the graphs as presented look like interesting stuff to me. I am about as Joe Six Pack as you can get without owning a pickup truck (used to) with a gun rack (never did that),, but that does look to me like wat I thing I see--sound economy with an overlay of berzerk finance. Great for us young'ns, everything is cheaper. Stan: Actually, 1982 is as good a starting point as any. If you went back further, the trend line would even be flatter. 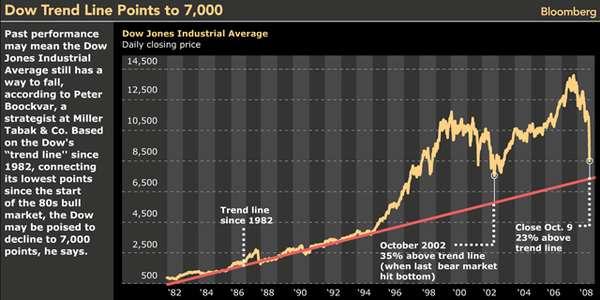 From 1928 to 1981, the DJIA only grew by about 700 points. Real growth in the average started around 1982.